The Phillies added Manny Machado's former infield coach to their staff on Thursday. Let’s get this out of the way: Manny Machado won’t sign with the Phillies because they hired his longtime coach or the Chicago White Sox because they filled their lineup with his brother-in-law and one of his best friends. Machado almost certainly will go where he can make the most money, just like most other marquee free agents. But if you’re serious about investing upwards of $250 million in one player for the next 8-10 years, it only makes sense to surround him with the best possible support system, especially when that player is as exceedingly gifted yet frequently enigmatic as Machado. So when the Phillies had an unexpected opening last month for a major-league infield coach, Bobby Dickerson rose to the top of their short list before getting the job late Thursday night, according to multiple sources. #Phillies have hired Bobby Dickerson as major-league infield coach, a source confirms. Decision was made late last night. @masnRoch was first on the news. Dickerson is well-regarded infield coach and longtime mentor to Manny Machado. Dickerson, 53, knows Machado as well as almost anyone in professional baseball. They met when Machado was 16. 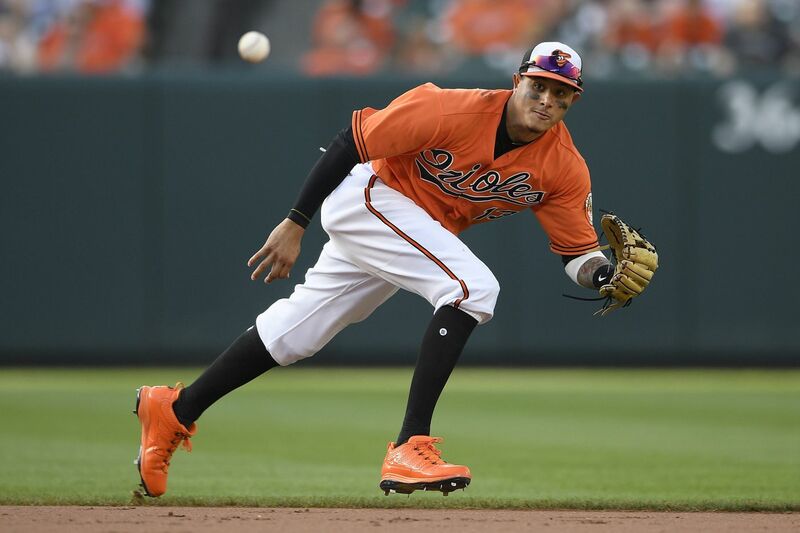 As an instructor with the Baltimore Orioles, Dickerson played a central role in turning Machado from a natural shortstop into a two-time Gold Glove third baseman. Over the years, they have had long talks about the All-Star that Machado is and the future Hall of Famer that he can be. Case in point: Midway through the 2012 season, with the Orioles trying to improve their defense at third base, many team officials believed Machado could make an easy transition to the position. Problem was, he grew up idolizing Alex Rodriguez and would need to be talked into moving away from shortstop. Dickerson, then a minor-league instructor, had an idea. He would tell Machado that he couldn't do it. New Phillies infield coach Bobby Dickerson (right) has known Manny Machado since the star infielder was 16 years old. It’s worth mentioning, at this point, that Dickerson is also a darned good infield coach. He gets credit for nurturing second baseman Jonathan Schoop in Baltimore, and with Schoop, shortstop J.J. Hardy and Machado, the Orioles had perhaps the best infield defense in the majors when they won the American League East crown in 2014. The Phillies were baseball’s worst defensive team last season. They struggled with infield shifts, a problem amplified by right-hander Jake Arrieta’s critical comments in early June. And when infield coach Jose David Flores left last month to join the Orioles' staff under new manager Brandon Hyde, it created an opportunity for the Phillies to bring in a replacement to spur improvement. Dickerson’s usefulness, then, goes beyond merely being the Machado Whisperer. But if Machado does wind up choosing the Phillies over the aggressive White Sox or a proverbial “mystery team” that unexpectedly emerges (the New York Yankees seem to be heading in another direction after Friday’s signing of infielder DJ LeMahieu), Dickerson’s presence should help allay concerns that exist within the walls of Citizens Bank Park about Machado’s occasionally wavering effort level. "I'll say this: When Manny puts his mind to something, it's just unbelievable to watch. He's that talented," Dickerson said. "In 2013, he was the best defensive player I've ever seen in my life. If he's locked in, he can change the game with his glove. For sure, I've seen it. The challenge is his locked-in-ness, and that's well-documented. "What I do respect about Manny is that he owned it. He's not going to be 'Johnny Hustle.' [But] he's going to play 162 games, and when he grounds out, he's going to run three-quarters to first base. OK, that's what you're buying. And you're buying the 40 doubles and the 40 homers." And it only helps to have someone around who understands how best to tolerate the former while maximizing the latter. The Phillies were unable to reach agreement with arbitration-eligible ace Aaron Nola on a 2019 salary before Friday’s deadline to exchange figures. Nola is seeking $6.75 million, while the Phillies are offering $4.5 million. It’s unclear whether talks will continue before a hearing date next month, according to a source. It’s also more likely at this point that the Phillies will sign Nola for one year rather than working out a multiyear agreement. Nola isn’t eligible for free agency until after the 2021 season. ... Agreements were reached with second baseman Cesar Hernandez ($7.75 million), third baseman Maikel Franco ($5.2 million), right-hander Vince Velasquez ($2.249 million), lefty relievers Jose Alvarez ($1.925 million) and Adam Morgan ($1.1 million), and outfielder Aaron Altherr ($1.35 million). ... Former first-round picks Mickey Moniak and Adam Haseley, both outfielders, will be among the Phillies' non-roster invitees to spring training. ... The Phillies signed infielder Gift Ngoepe, left-hander Edward Paredes and infielder Andrew Romine to minor-league contracts with invitations to major-league camp. ...The Phillies are scheduled to visit with megastar free agent Bryce Harper on Saturday in Las Vegas, Harper’s hometown. Owner John Middleton will attend the meeting.